How and what Ranil Wickremesinghe is strategizing is anyone’s guess. But given the man’s shrewd yet hereunto unsuccessful attempts at being seen as a winner, if Ranil Wickremesinghe is the candidate from the United National Party (UNP), only by being triumphant at elections can he be established as a successful politician. 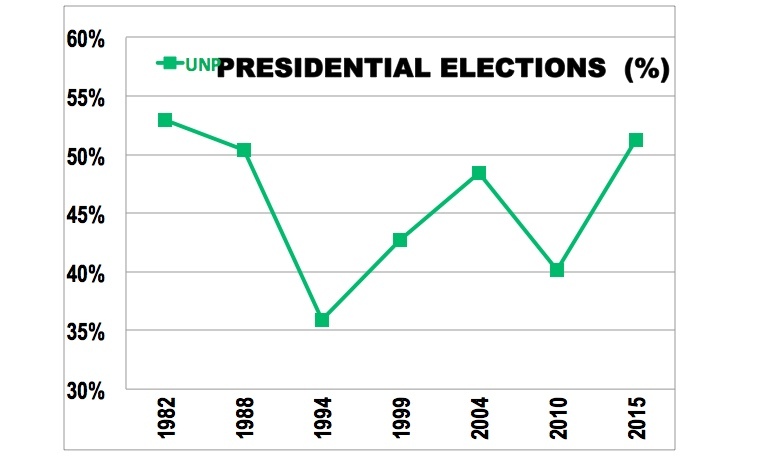 A close analysis of the Presidential Elections held unto to date, would reveal that, given the progressive erosion of the UNP vote base since 1994, a candidate representing the Grand Old Party of Sri Lanka without the willful and proactive assistance of the other members of the grand coalition that got together in 2015, he or she representing the UNP alone would have no chance whatsoever in the forthcoming Presidential Elections in 2020. The UNP candidate by himself scored over 50% only in 1982 and 1988. In 2015, the UNP-backed candidate, Maithripala Sirisena the current President, scored barely over 50% with the backing of a carefully established anti-Rajapaksa coalition, spearheaded by the late Venerable Maduluwawe Sobitha Thero and a fair number of Buddhist, Christian, Hindu and Muslim clergy. Maithripala, himself could boast only of the Polonnaruwa district while districts where Sinhalese Buddhists dominated, especially the Deep South, the hinterland of Monaragala, Ratnapura, Kalutara and Anuradhapura overwhelmingly chose the corrupt Rajapaksas. Ever since the demise of the Sobhitha Thero, the Buddhist element of that anti-Rajapaksa coalition has nothing but adamant and vocal denunciation of the governance and government of that coalition run by the duo of Maithripala and Ranil. The recently held local government elections exposed the miserably deficient political and social awareness of those who run the two factions of the coalition government. The scandalous ‘Bond-Scam’ precipitated the latent fissures in the coalition to surface out, and the potential breakup of a delicately-bonded relationship between Ranil and Maithripala threatened to demolish all hopes and expectations of those who loyally supported the coalition government. Ironically enough, both Ranil Wickremesinghe and Maithripala Sirisena seem to be bogged down in losing attempts at buttressing the positions in their respective parties, UNP and SLFP. Absent a charismatic leadership at the top, the United National Party meandered towards certain defeat at the local government elections in 2018. The ember that was oozing to attract a mere flicker of flame to catch uncontrollable fire was rekindled in the UNP. The leadership of Ranil Wickremesinghe is being talked about in close circles of the UNP, although those who whisper about such a change in leadership dare not come out in the open solely because they are in power. Those who are seriously concerned about the fate of their Grand Old Party would not gamble; the powerful portfolios they hold within the government ranks and the glory of being close to the throne, access to the coffers and power-machinery of government seem to have affirmed the age-old saying that ‘those in power will not allow any potential damage to that power’. It is that power and its grip on their life and their political journey that keeps them from speaking or taking action against the current leadership of the UNP. That indeed is a tragic circumstance in any political dynamic, anywhere else in the world. Whatever the field or subject they disagree on, they always agree that they should remain in power, at least for the time being. Shortsighted allegiance to the raw elements of power precludes them from being adventurous and daring! Now, have a peep into the following line chart that also includes the recently held local government elections as an expression of the voters in a ‘Presidential Election’ for ease of comparison. The picture is alarmingly precarious. There is no way a UNP candidate by him or herself could secure any ‘respectable’ second position in a Presidential Election. With the virtual departure of Maithripala Sirisena from the coalition that defeated the Rajapaksas in 2015 and the dismal performance of the traditional Sri Lanka Freedom Party (SLFP) led by President Sirisena, the emerging blooming of the Pohottuwa, pun intended, seems to overshadow any partner in the current coalition government. If this reality does not penetrate the closed mindset of the inner-conclaves of the current UNP leadership, they are indeed in for a sure and pathetic performance at the next Presidential Elections. If they want to be successful, the UNP needs to get the same coalition-forces that propelled Maithripala to Presidency. What are those forces and who are the most qualified and deserving candidates who could muster such a force? It is almost certain that Maithripala Sirisena has written himself off of the UNP-led coalition candidacy. The gulf between the President and the coalition forces that empowered him is widening by the day. That sad and lamentable story is behind us. No notable political mind seems to be preoccupied with the nuances of the breakup. Maha Sanga’s backing for a UNP-backed coalition candidate is almost absent. Although the incarceration of the notorious Galagoda Atte Gnanasara failed to galvanize an anti-UNP wave in the country, the local government election results show a marked loss for the UNP amongst the Sinhalese Buddhist voting bloc. Ranil Wickremasinghe being at the helm of his party seems an enormous disadvantage for attraction of any more Sinhalese Buddhists than what is already there. However, one of the biggest plusses Ranil enjoys is his being accepted and trusted, at least by the leadership, of the Tamil community in the country. In that particular regard, Ranil has no equal. Lack of activity in the pursuit and conclusion of the Rajapaksa-ridden corruption deals weighs heavily on shaping of minds of the leaders of those civil organizations which backed Maithripala Sirisena’s candidacy in 2015. These creators of the Yahapalanaya concept are thoroughly frustrated by the lack of activity in the sphere of pursuit of justice against those who are alleged to have committed corrupt practices of historic proportions. Apart from the apathy shown by some powerful Cabinet Ministers, what has been apportioned to Prime Minister Wickremesinghe is having a telling effect on the electorate. The emphasis by Sri Lanka’s civil organizations whose premier aim is purported to be a peaceful country with social, ethnic and economic harmony cannot be overstated and their visible withdrawal from the Ranil/Maithri government would amount to a large number of independent voters staying at home come the Election Day. Furthermore, their agitation-prone activities are now aiming at destabilizing the very government they helped to create. Maithripala-led SLFP is a very sad story. The death of the political entity created by SWRD Bandaranaike seems to be nearing its end at an exceedingly fast pace. That elementary constituency of the SLFP seems to have departed, instead of greener pastures, in search of bluer waters- Sri Lanka Podujana Peramuna (SLPP). President gambled a lot on his ability to lead an SLFP without the Rajapaksas and he lost very badly. SLFP or whatever that is left of it is a far cry from what SWRD launched and unleashed. In such a wide and varied context of political uncertainty, the only silver line is a faint hope on the part of some UNP stalwarts that a change in leadership of the UNP is in the offing. Its second tier seems to be well settled and ready but the absence of even one single person to ‘bell the cat’, would eventually cost them lock, stock and barrel. Wishful thinking could be damaging both in the short and long run. It will be harmful in the short run as a damaged and a seemingly un-united party would not be ready for an election. In the long run, such a change would be treated as a redundancy as everyone would surmise that the train has already left the station! It’s a Hobson’s choice, Take it or leave it. More (And More) Of The Same!